Hydraulically operated, sheet bending presses are suitable for bending steel sheets of various widths & thickness. These presses are fitted with a best hydraulic pumps, which give very long & maintenance free service. Bending presses have improved features with measuring and control system operating on at least four points of the bending angle. Bending machines are used to bend metal by pressing it into a die. There are several types of bending machines in a variety of functions and specifications. Bending machine forms angles in sheet metal. A bending machine can bend sheet metal to almost any angle. A bending machine integrates cells of right angle shears, laser cutters, turret punch/presses and bending units to form a seamless system. The bending machine cells can load, scrap, remove, sort and stack. The overall bending machine system can load and stack sheets, look after component stack buffering, provide cell to cell transfer, and remove bent components. Bending machines are designed and manufactured to meet most industry specifications. Sheet metal presses are used in metal forming process to produce thin and flat pieces in a variety of different shapes. Sheet metal presses are highly effective in producing car bodies, airplane wings, medical tables, roofs for building, etc. These presses are one of the fundamental machines used in metalworking. Presses are available in different specifications to meet the countless requirements of the industry. Moreover, there are many different presses to process the sheet metal of aluminum, brass, copper, steel, tin, nickel, titanium, etc. 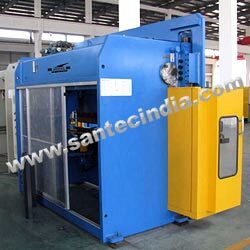 Santec offers sheet metal presses for different metalworking processes like deep drawing, cutting, spinning, roll forming, stamping, etc. Folding equipment can be used to stiffen new metal panels that would otherwise flap around and to put lips on pieces of sheet that would normally need screws passed through the front face. Folding equipment is also available with other features such as backlash free servo gear motors that provide better accuracy and 30% higher speeds, dual drive tool changer, automatic clamp folding tools with integrated tab, offline tools, and fast infeed and outfeed systems. A folding press is disclosed having a frame supported by a fixed base, a fixed beam and a ram beam supported by the frame.